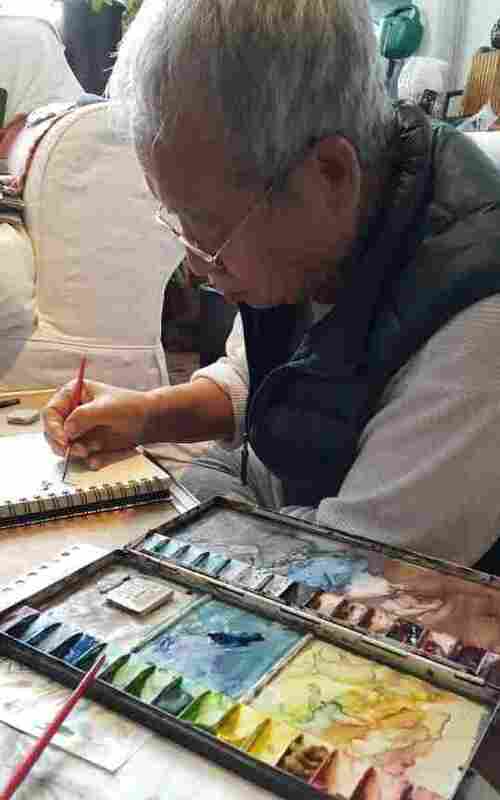 Instagram Grandpa's Art Carries His Love Across The World : All Tech Considered At 75, Chanjae Lee hated the idea of learning this bizarre thing called Instagram. He also hadn't picked up a paintbrush in years. But then, his grandchildren moved away and a baby was born. This is a story about love and transformation. But first, it starts with resistance. At 75, Chanjae Lee absolutely hated the idea of learning this bizarre thing called Instagram. He had never used the Internet before, never once owned an email account, and never understood the concepts behind Google or Facebook. Why did he have to learn Instagram? It was because he missed his grandchildren, dearly. When they all lived in Brazil, Lee loved seeing his grandchildren every day: driving them to school, then picking them up, eating lunch together. But when they moved away to South Korea, where Lee originally emigrated from, he felt stuck and didn't know how to spend his extra time. He started watching Korean television. A lot of Korean television. That worried his family. 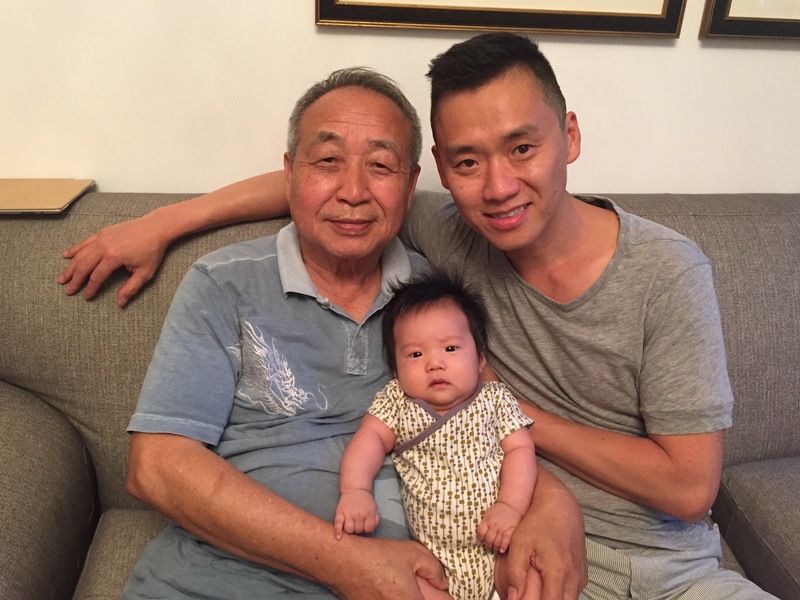 Lee's son Ji, a designer who works for Facebook and lives in New York, wanted to steer his father back into something more productive, like drawing again — as he used to do a lot when Ji was young. What if his father could draw a picture, and then his mother — who's much more curious about the Internet and social media — could post it on Instagram? The plan didn't go far, Ji says. "My father really hated the idea of drawing again. He didn't understand ... why would anybody be interested in looking at his drawings?" The idea felt forced. They tried it anyway, but the process was painstaking. Chanjae hadn't picked up a paintbrush in 35 years, and Ji struggled to coach his mom over the phone on how to angle shots and use filters. After a few months, they were ready to give up the hassle. That's when Ji's own son, Astro, was born — and everything changed. Father, son and grandson: Chanjae Lee, Ji Lee and baby Astro. Ji finally convinced his father to give Instagram another chance, so his grandchildren could get to know him — even when, one day, he is no longer around — through his lasting art. This is the story that Ji shared in a sweet slideshow on Facebook that hit more than a million views in its first 24 hours. The creation of Lee's new account, "drawings_for_my_grandchildren," began a new challenge: teaching the 75-year-old grandpa to use Instagram himself. It took about a week of sitting down for several hours each day until Ji's father grasped what the photo-sharing app did. They walked through the basic steps — opening an app by clicking an icon, taking the pictures, applying filters, adding captions — over, and over, and over. Ji says he's learned a lot about empathy and patience: "I caught myself getting annoyed at him, saying 'Oh my god I told [you] like 20 times, how can you not get this!' And I had to tell myself, 'OK, you have to calm down and slow down, because he just doesn't know. ... He wants to learn, it's just extremely difficult for him.'" Hashtags presented the most bewildering concept for Chanjae to grasp. It finally clicked, Ji says, when he described it as an "organizing system" for topics that people on Instagram are interested in: type in some words with this sign in front, and a bunch of related posts pop up. He showed the process by looking up #watercolor, and his father was shocked. "Oh my god, that's fun!" he said, very impressed. "There are amazing watercolor drawings!" Since then, Chanjae has not only been posting his drawings on Instagram, but he now also uses Facebook, Google and the iPad that Ji recently bought him as a gift — every day. His grandchildren love seeing the pictures on Instagram, along with more than 110,000 others who follow his account — a response that has surprised the Lee family. "This project really changed the life of my father and my family," Ji says. "The most rewarding thing so far has been receiving hundreds and hundreds of messages from people who said, 'Your story's inspired me so much to talk to my parents who are old, who used to paint or used to take photos, and I'm going to now talk to them and teach them how to use Instagram.' "
For melting our hearts ... thank you, grandpa! Could Video Chats Be Good For Your Infant?